Dura-Ace moves to the next generation. Reduced shifting effort lets you concentrate on riding. More control thanks to improved ergonomics. Unbeatable reliability gives you confidence. Tested in competition and taken to victory by pro riders in all conditions - on the road, across the pavé, through the mud. Dura-Ace: Concentration, control and confidence. 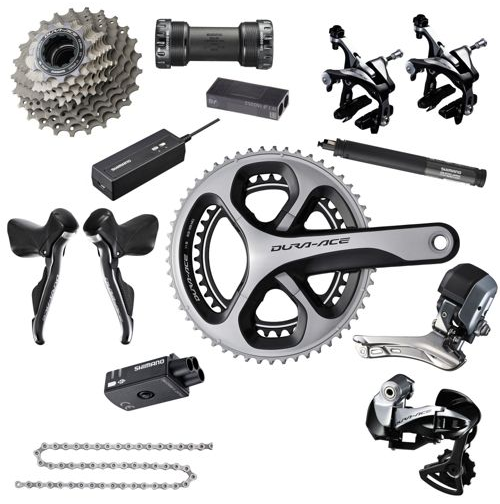 State of the art Di2 electronic technology for instant, accurate shifts first time, every time, at the push of a button. Precise, lightning-fast shifts across an 11-speed cassette, whatever the conditions, with just a button click. The 9070 rear derailleur is now more compact and lighter, with E-tube connection to simplify installation. And automatic crash protection moves the cage out of harm's way. With single-wire E-tube connection to the rest of the system, the front derailleur is able to automatically trim itself as you shift the rear derailleur, eliminating chain rub. Click the button below to add the Shimano Dura-Ace 9070 Di2 11 Speed Groupset to your wish list.